They can grow up to 13 cm / 5 inches fully grown. They live in water pentameters of PH range 7.0-7.5 and temperatures of 22-26 Celsius / 72-80 °F. They are a tropical frog so do prefer warmer temperatures. 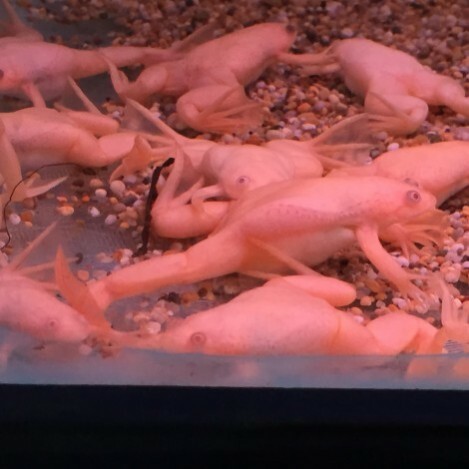 These frogs are fully aquatic so are best in full water tanks, they will however pop up to the surface of the water to get some air every now and then. They do not stay small, and they do like meat in there diet which can also be fish big enough to fit in to there mouths. So we would recommend mixing these frogs with bigger size fish. They eat food of the bottom of the tank so sinking food is best, like pellets or granular foods. They also live on a diet of meat so live or frozen bloodworm, or brine shrimp is good for them. 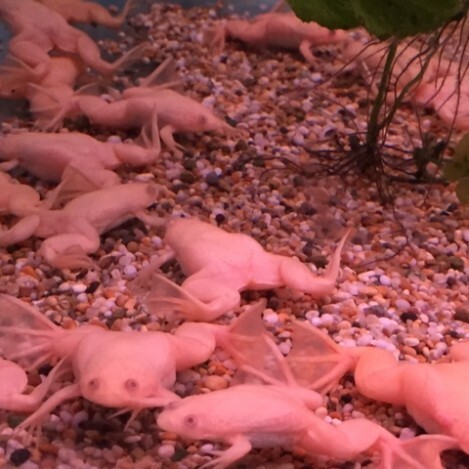 Albino frogs are bottom feeders. The food needs to sink to the bottom of the tank for them to feed. They are a meat eating frog so they do require live or frozen foods in there diet. Once a day feeding is more than enough for the frogs.